Kasumi is tutoring Nagi and Fuuka to help them catch up since they also have regular school to focus on. Kasumi notices Star-san behind the wall and asks him not to cause any trouble in the meantime. But Kinji says he also has a lot to worry about, remembering Grandpa’s one month deadline. Anyway, Kinji won’t be able to target Kasumi-nee anyway. He gives it a shot, but even while studying, Kasumi manages to uses Ninjutsu to keep him at bay. 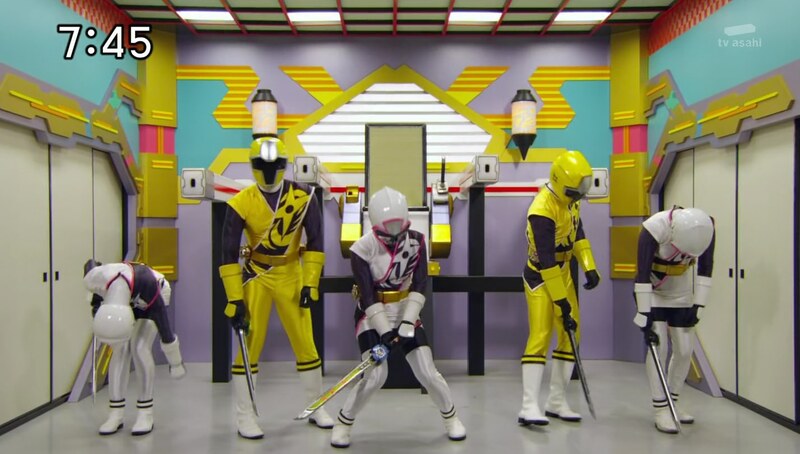 They tell Kinji to go fight Takaharu and Yakumo instead. Takaharu and Yakumo are out looking for the Sky OtomoNin. 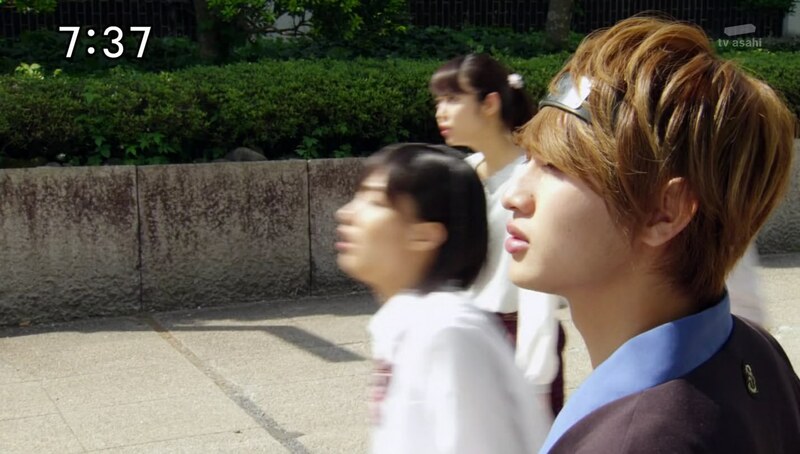 Kinji arrives, but sees they’re busy too, so he can’t challenge them today either. Masakage points his staff right at her face and says she has no right to express her own opinion to him. She apologizes and kneels. He tells her a lowly Youkai like her will be easily dispatched if she fails. Kinji gets a Youkai alert and decides to hurry over. He tells Rodeomaru he can head back for now. Rodeomaru speeds off, but Futakuchi Onna approaches him and tries to sweet talk him. Kinji meets the others at the location the Youkai was detected at, but they find nothing. Masakage mispronounces her name again, but Kyuuemon follows orders and summons a Gashadokuro with eyebrows. Kinji is excited to have another Youkai to add to his collection and he henges. 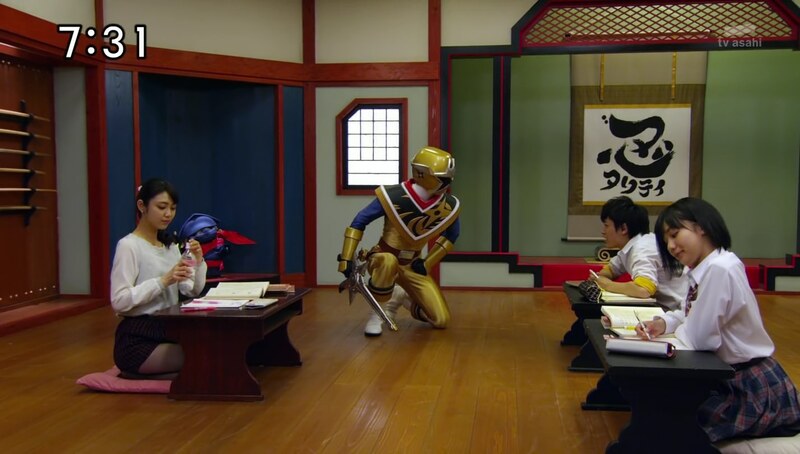 Kinji summons Rodeomaru, but he doesn’t arrive. The others henge and hop into ShurikenJin. While the cousins fight off the Gashadokuro, Rodeomaru finally appears. But he is now accompanied by Futakuchi Onna who introduces herself as Rodeomaru’s attorney. 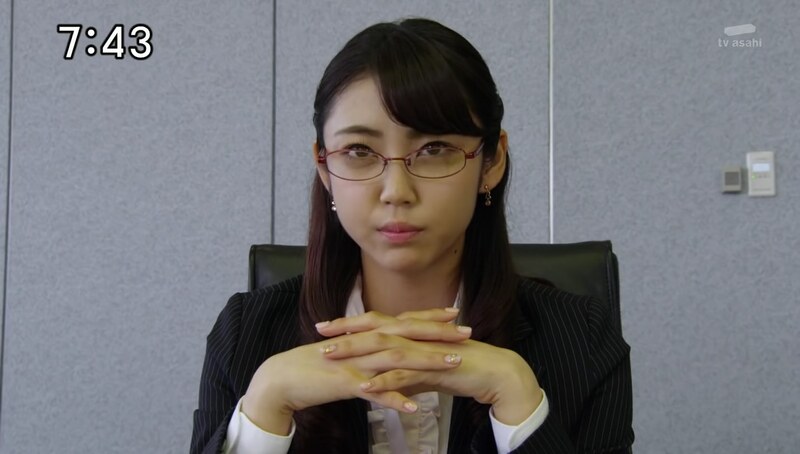 She tells Kinji that Rodeomaru wants to enter negotiations as he is not happy with the working conditions and lack of compensation. Rodeomaru has put his thumbprint on a contract allowing Futakuchi Onna to negotiate on his behalf. But Kinji doesn’t believe Rodeomaru would ever do such a thing. Rodeomaru-san starts attacking ShurikenJin. They see Futakuchi Onna is trying to get Kinji to also sign a contract. 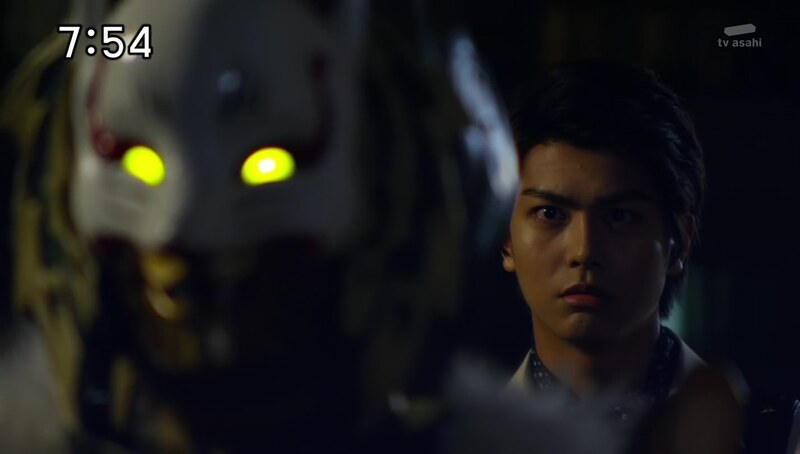 Takaharu tells Kasumi and Yakumo to save Kinji while he goes fight off Rodeomaru with Shinobimaru. He tosses Nagi the UFOmaru and Paonmaru Shurikens so he and Fuuka can take care of the Gashadokuro. Futakuchi Onna hands Kinji the contract to sign, but Kasumi and Yakumo arrive to stop him. They will act as his attorneys and negotiate for him since he is too easily persuaded. Very well, Futakuchi Onna says. She zaps them into a conference room where they can negotiate. Kasumi uses a Beautiful Attorney Ninpou to dress the part. Futakuchi Onna says there will be no fighting and only talking in this room. She is determined to win to prove herself to Masakage. Kiniji asks Kasumi if they can actually win this. She has no. But they will not lose either. Nagi and Fuuka use Cloning Technique to help them maneuver ShurikenJin Paon and ShurikenJin UFO better. But Rodeomaru is beating down Takaharu and Shinobimaru. 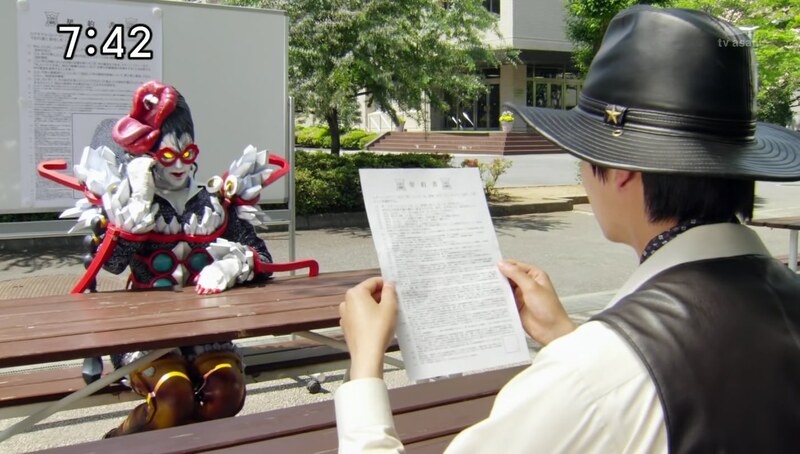 Kinji can’t take it anymore so he puts his thumbprint on the contract which puts him under Youkai control. He attacks Yakumo as Futakuchi Onna presents another contract for them to sign. Nagi and Fuuka manage to take care of the Gashadokuro, but Rodeomaru flips Shinobimaru over and turns his attention to them. Rodeomaru forces ShurikenJin UFO to split apart. Rodeomaru starts shooting at buildings all over the city and Masakage tells Juubei Kyuuemon to summon another Gashadokuro. Nagi, Fuuka and all the OtomoNin return to help fight. Yakumo offers to give his thumbprint, but Kasumi says he should not. Does she have another plan? Nope. In fact, she gives up. Futakuchi Onna is just too good. Kasumi winks to Yakumo and he plays along. They try buttering Futakuchi Onna up and she remembers how much Masakage disregards her. Kasumi says she should not stand for that, not as a Youkai or as a woman. Futakuchi Onna should be able to spread her wings and fly to sky! Futakuchi Onna is convinced. She will not kneel at Masakage’s feet no more. She takes the contracts and rips them in half. When Kinji and Rodeomaru are back to normal, Kasumi reveals to Futakuchi Onna that she was only using Flattery no Jutsu. Kasumi henges and stabs Futakuchi Onna in the shoulder, releasing them from the conference room. Kinji hops back onto Rodeomaru and they go Bison King to fight the Gashadokuro. The Ninningers do a roll call before Kasumi leads everyone to take care of Futakuchi Onna. After Kinji finishes off the Gashadokuro, Kyuuemon approaches him and asks for a chat. 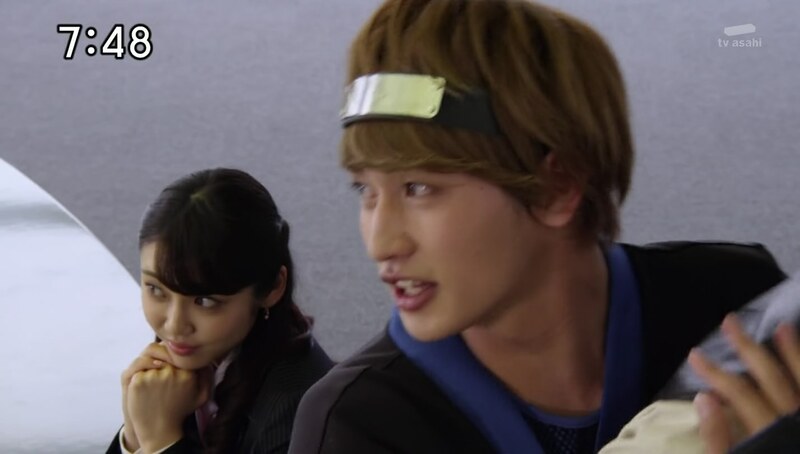 Kinji says he wants to ask her why she betrayed Last Ninja-sama. Kyuuemon says he was afraid of leaving the Finishing Shuriken of the End to her, a non-Igasaki. From her perspective, Grandpa betrayed her first. 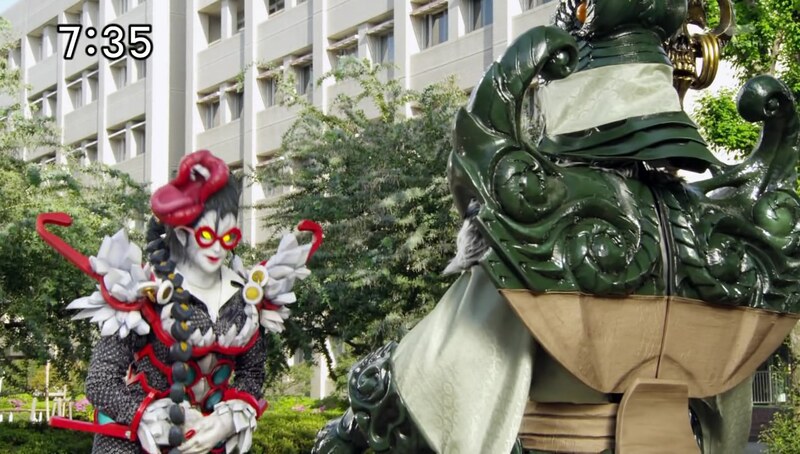 So why doesn’t Kinji become her pupil instead. Together, they can take the Finishing Shuriken of the End themselves. How does she know he wants it? She tells him to think about it. The cousins find Kinji who apologizes for causing trouble again. They say it’s okay. They compliment Kasumi for being awesome. Nagi calls her the ‘secret boss’ of the dojomanse. They head home as Kinji thinks about the offer. I think overall this was an okay episode. Best part was definitely Kasumi being awesome. But then again, her being awesome came at the expense of Futakuchi Onna. But I did like seeing that maybe Kinji still has more secrets we don’t know about. And seeing Nagi and Fuuka working ShurikenJin on their own was good too. Should be interesting to see the Kyuuemon story play out. Ooo! Didn’t think of that ship! Really? Well it’s kinda adorable. I began shipping them in episode 11.